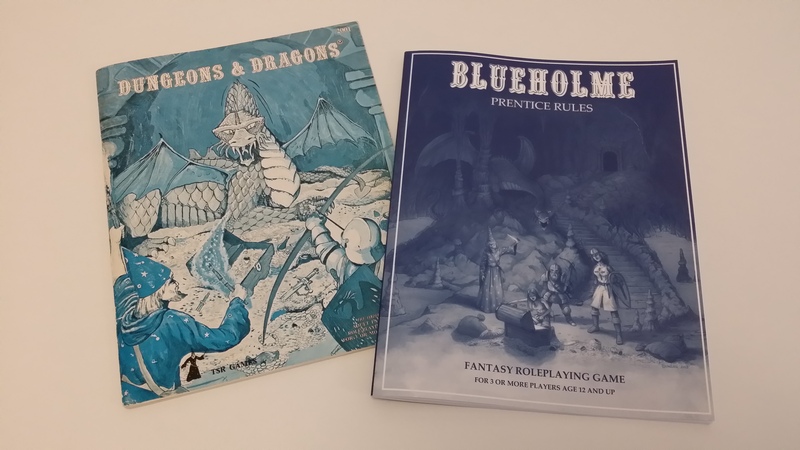 The first print proof of the Lulu print-on-demand version of the BLUEHOLME™ Prentice Rules has arrived. Soft cover, perfect bound, and shiny. I have a few observations, and I think I might need one more try before I’m satisfied, but overall I’m happy. Who am I kidding, I ran around the flat waving my arms in the air and singing a silly tune – but let’s not dwell on that. The blue of the cover is not quite the right shade – I want to try for something a little closer to the Holmes book you can see to the left there. Although the perfect binding seems fine so far, I also want to try a saddle-stitched option. If that works, I’ll probably offer both options. The interior looks good, and the 10-point font is nicely readable – something that I can’t say for most rulebooks in this day and at my age, I’m sad to say. However, for the Compleat Rules I am still in two minds as to whether to stick with 10-point or go 9-point to reduce the page count. Hey, this is pretty cool news! Blueholme is a really great Holmes clone with a neat fairy-tale feel to it.